Alabama Mardi Gras | 2012 Alabama Mardi Gras Parade Schedules & more! Where is Mardi Gras? 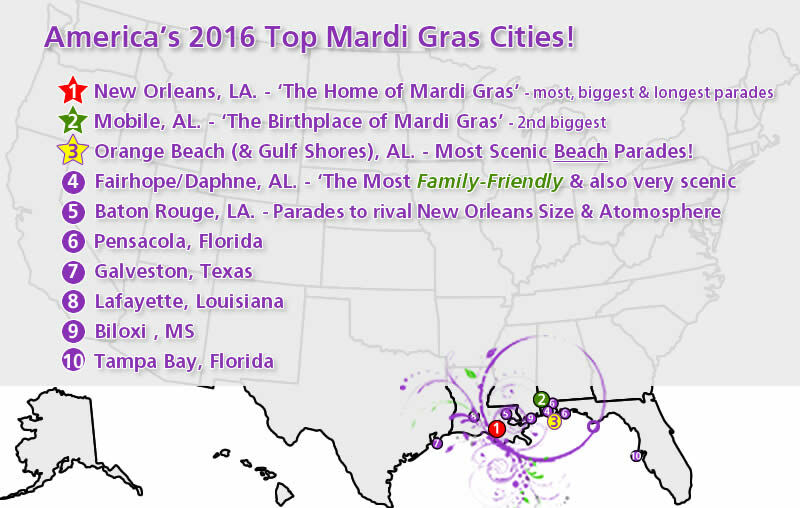 Mostly on the Gulf Coast, primarily in Alabama & Louisiana, though also done very well in Florida, Texas & Mississippi, Mardi Gras is spreading across the U.S. in 2016! Click here to follow us on Twitter, at www.Twitter.com/ALMardiGras Be the first to hear parade schedules, mardi gras announcements & future mardi gras parade dates. Check out exciting parades all around the United States, where Mardi Gras is more about art, music, and generally good fun than it is about anything else! Welcome to the (un)Official Where Is Mardi Gras Website! Let us know: What is your TOP10 for Mardi Gras Parades in 2016? Have a Mardi Gras krew, parade or website you would like listed here? What makes them 'so great' to make the Top 3? Mobile: Simply the OLDEST - the birthplace of Mardi Gras! Orange Beach (& Gulf Shores) - where else can you have Mardi Gras & sugar-white sands literally side-by-side, together?! Orange Beach parades on a Saturday & then joins up after the Gulf Shores Parade - for 1 long family-friendly parade ON MARDI GRAS DAY, FAT TUESDAY!!! *** Fairhope & Daphne make a close 4th on the 'Eastern Shore' of Mobile, for their tremendous 'Family-Friendly Mardi Gras parades appeal!' but with no parades on Mardi Gras Day, Fat Tuesday, they can't be in the Top 3, nationally, but in Alabama, definitely worth seeing! More Alabama Mardi Gras Parade Schedules, Announcements & Links - coming soon!